Life is hard for Ridgway’s hawks, a species found only in a small sliver of habitat on the Caribbean island of Hispaniola. Once found all over the island, the hawks have steadily declined due to local humans killing them and clearing their forest habitat. If that weren’t enough, their chicks are threatened by botflies, whose larvae burrow into the young birds’ skin, consuming them from within. Now, scientists are going to extreme lengths to save chicks from that grisly fate. A team of researchers are climbing high into palm trees—braving clouds of wasps, 70+ foot falls, and angry hawk parents—to reach nests, where they spritz the fluffy nestlings with a life-saving insecticide. This successful approach is helping to bring the raptors—which number only about 300 today—back from the brink of extinction. 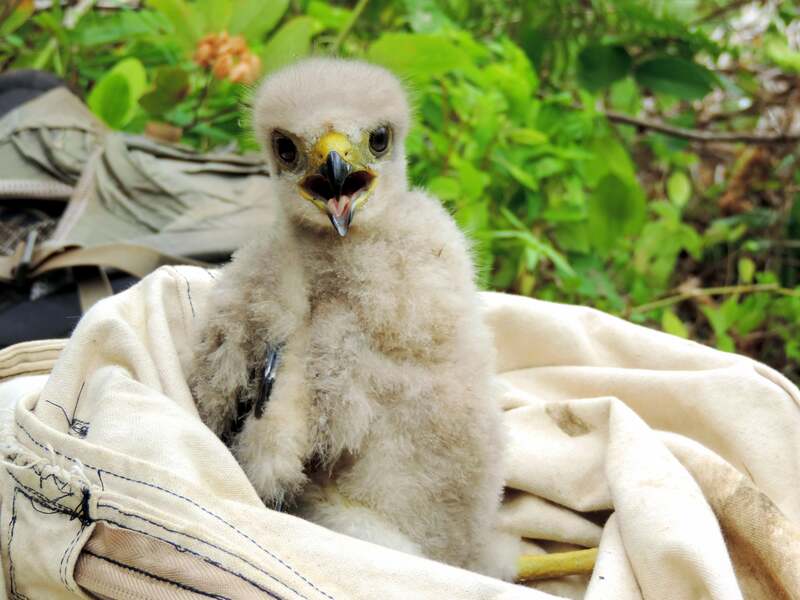 It all started in 2011, when The Peregrine Fund, a non-profit organisation devoted to the conservation of birds-of-prey, became concerned that the hawks were disappearing. So, the organisation sent biologists to the Dominican Republic assess the situation. What researchers found was alarming. “We realised there were problems in the nests,” said Christine Hayes, a biologist with The Peregrine Fund and Boise State University. 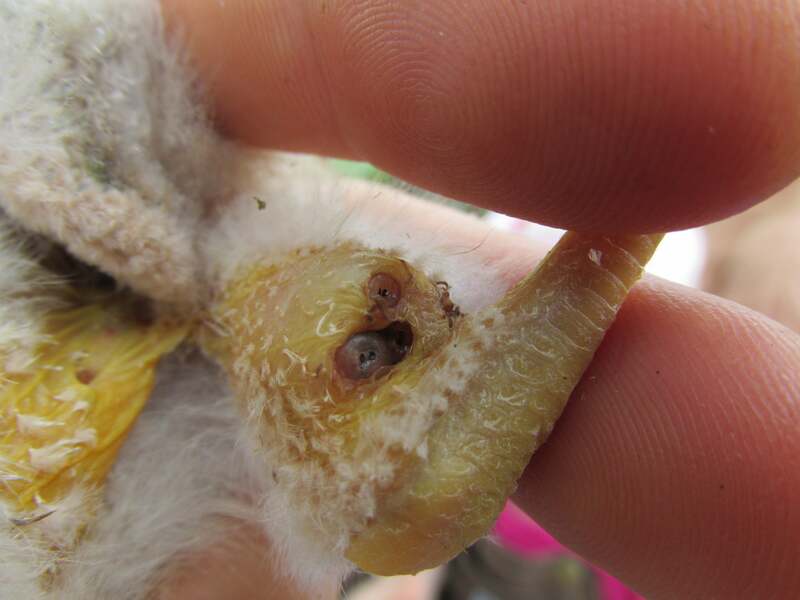 Chicks were turning up loaded with Philornis botfly larvae embedded in their flesh. And not just a few unlucky birds here and there. Almost every chick had these parasites. Worse, it appeared as though the botflies were actually wiping out the young hawks. At first, the researchers tried manually removing larvae from chicks, but for many nestlings it was too late. Thomas recalls one nestling that hosted over forty botflies. It didn’t live. When the team reported its grim findings to The Peregrine Fund, it spurred a new effort to fight back. Eventually, researchers found a promising remedy through conversations with the Santo Domingo Zoo in the Dominican Republic, which routinely used fipronil—the flea-killing insecticide in Frontline, commonly used on dogs and cats—to treat parasites when raptors would come into the zoo with infestations. But to administer the medicine, the team would have to access the hawks’ nests. That’s easier said than done. In groups of four, the researchers hiked through the rugged tropical forests of Los Haitises National Park using a system of trails, many of which are little more than narrow paths traced on a veneer of slick clay. Some nests may be relatively close together, but after visiting seven or eight nests in a day, the team ended up trudging more than nine miles every day. But getting to the nest sites is only a fraction of the challenge the researchers faced. Ridgway’s hawks have a habit of building nests in the crowns of royal palms, which can be over 80 feet high. “The hard part about climbing palm trees is that they’re essentially straight up, smooth, and there are no branches or anything to throw a rope over,” Thomas explained, adding that since the nests are right in the crown, sending a rope over the fragile palm fronds isn’t an option. When the team first started working with hawks on the island in 2011, the only way people were getting into the trees was by using the pole climbing spikes that electrical linemen wear. But this method risked damaging the trunks, so after a few years—and plenty of experimentation—Thomas Hayes developed a new system for climbing the palms. A climber uses two key tools: a rope looped around the back of the trunk and clipped into a harness, and a lightweight, 3-step aluminium tree climbing ladder, which is placed against the side of the tree in front of the climber. The climber then alternates between putting weight on the rope and ladder while sliding the opposite component higher into the tree. 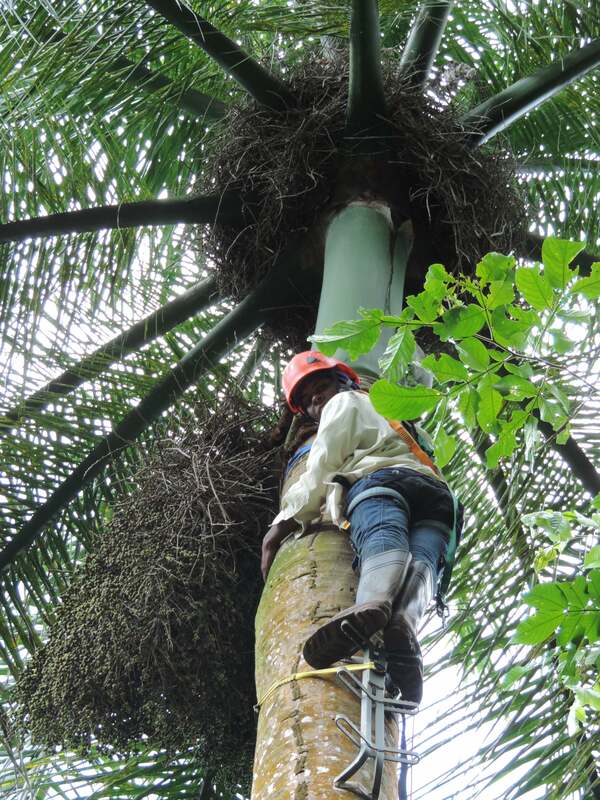 At the top, the climber unfolds and installs a portable aluminium platform against the tree, allowing them to stand up and reach into the nest safely, all without putting weight against the palm fronds or nest. The trip up the tree can have its own complications. Some palms are structurally unsound, with rotten hollows and un-anchored roots, and may be avoided altogether. The tree’s many animal residents can also complicate a climb. Holes in the trunk may house bats, and the canopy hosts large snakes and ants. But the worst thing to encounter on a climb are wasps, according to Christine Hayes. “There are some nests where you start to go up, and there are enough wasp nests that you can’t keep going,” she said. Once up at the top, the climber gathers up the chicks into a cotton sack and lower them to the ground where the rest of the team is waiting to treat them. “Then they’re waiting up in the tree for the people on the ground doing the work,” Thomas Hayes said, adding that the climbers have to treat the nest itself, and record any prey they find up there. As you might imagine, the chicks’ parents don’t take too kindly to this whole process. Both climbers and the ground crew have to collect data and squirt medicine on delicate nestlings while fending off enraged hawks swooping down on their heads. “When the adults try to attack us, we wave our arms so that they don’t hit us,” said Thomas Hayes, noting that preventing collisions is largely about keeping the hawks from getting injured. Sometimes, though, injuries are unavoidable. After misting down the chicks with fipronil using a blunt-tipped syringe, the precious cargo is sent back into the tree, and the irate raptors settle down. Over two years, the team ended up treating over one hundred chicks—reapplying insecticide weekly—and compared them with untreated nestlings. The insecticide treatment was astoundingly successful. The researchers found that spraying once a week for the first three weeks (and alternating weeks afterwards) reduced botfly larvae numbers by almost 90 per cent, and boosted hawk survival to fledging age by 179 percent. The results, published recently in the journal Animal Conservation, showed that just by treating the infestation, conservation workers can bring the species out of the red. “We are currently completely reversing the downward trend in the population.” Thomas Hayes said, adding that the hawk numbers have essentially doubled since 2011 in the areas the team has been working. Philornis botflies threaten vulnerable endemic, island birds across the world, from the Galapagos to Tasmania, so the researchers are hopeful the Ridgway’s hawk’s ongoing success story with insecticide treatment can be applied elsewhere. A next step for the project includes switching from fipronil to the anti-parasite permethrin, which would only require a one-time treatment of the nest, easing the stress on the palms, chicks, and climbers. 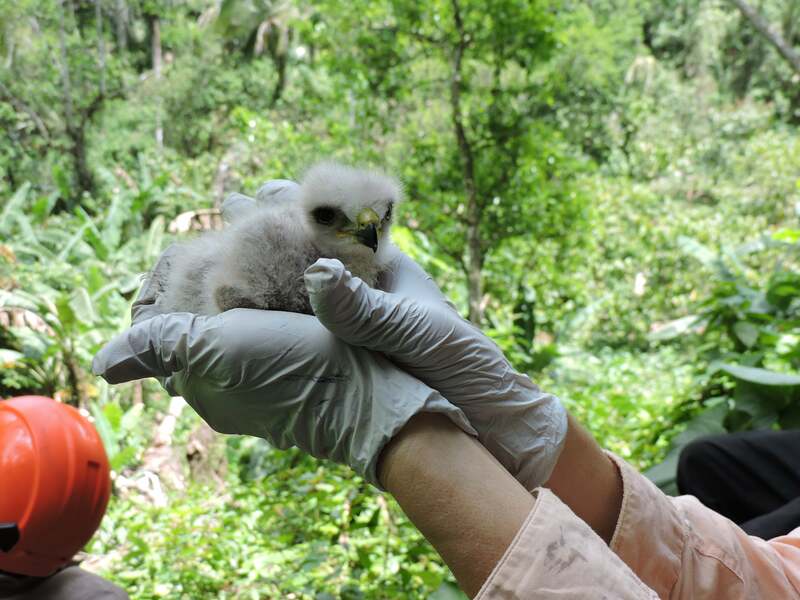 The Peregrine Fund also seeks to establish new populations of Ridgway’s hawks in other areas in the Dominican Republic. 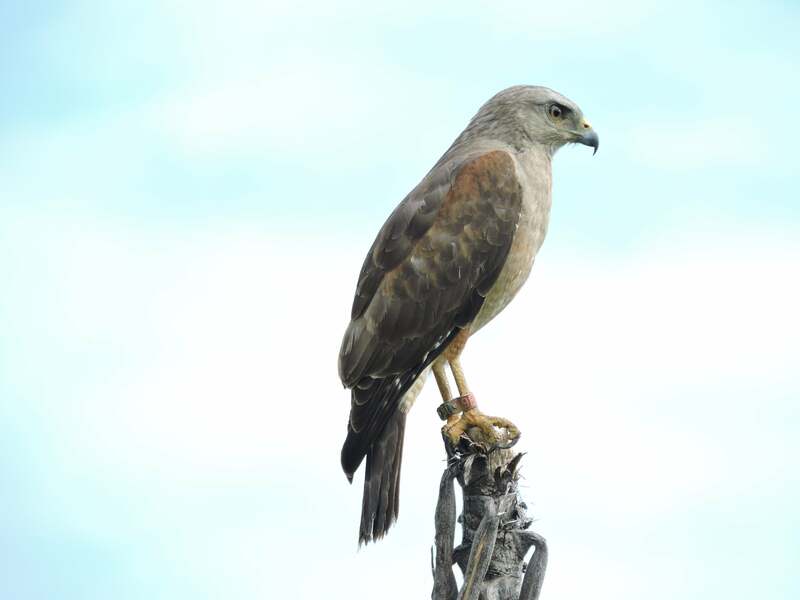 Already, since the organisation has been working with these hawks, a second breeding population has been established on the eastern tip of the island. Another continued goal for the team is the ever-increasing involvement and spearheading of the conservation effort by local communities in the Dominican Republic. While initially much of the fieldwork was done by researchers from outside the country, in the most recent season, nearly all of the work was conducted by locally-based technicians. While a substantial hurdle to the Ridgway’s hawk’s recovery appears to have its solution, the species still faces challenges. The hawks are persecuted in rural areas for their perceived threat to economically-important chickens. But Christine Hayes is hopeful, having observed a recent shift in attitudes among some in the nearby communities towards the hawks, and a recognition of their ecological importance. 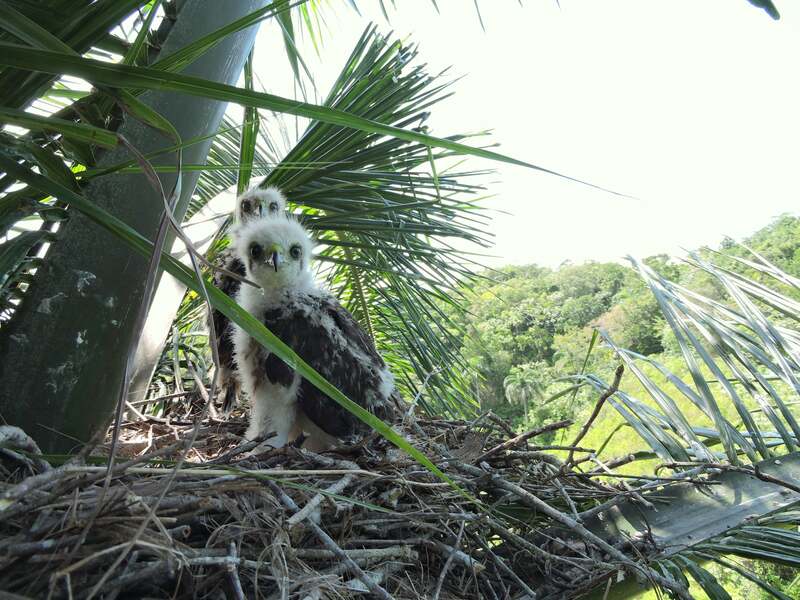 In the meantime, the island’s nestlings can rest a little easier among the palm fronds with humans around willing to put their bodies—and baseball caps—on the line to ensure their survival.